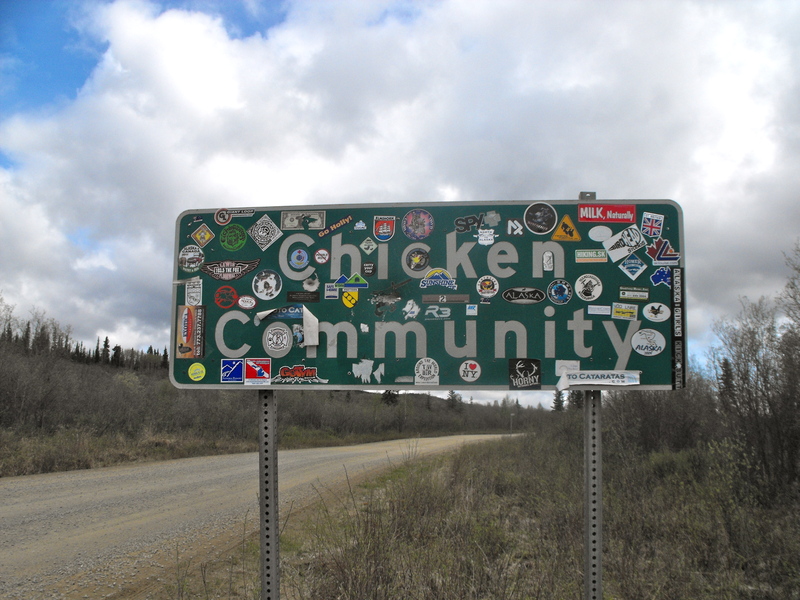 One of the quirkiest communities in the eastern Interior of Alaska is the village of Chicken. Located at about mile 66 of the Taylor Highway and is comprised of downtown Chicken, the Original Chicken Gold Camp/Chicken Creek Outpost and the Goldpanner. Chicken got its name in 1902 when it was incorporated officially. Rumor has it that the residents wanted to call it Ptarmigan, because that was the wild bird of choice for local prospectors in search for gold. But when it came time to officially name the town no one could spell ptarmigan, so they settled on Chicken. With only about 30 year-round residents and a deluge of tourists from the Lower 48, this little town near the Canadian border is very unique. There is little electricity for public use, few phones, little plumbing, and mail arrives only twice a week by bush plane, but with the lack of amenities this little hamlet makes up in eclectic charm. For visitors, there are several several gift shops, cafes and even a bar. Be sure to check out the Chicken Gold Camp, the most complete dredge open to the public in Alaska. If you are in Chicken in June (8th and 9th this year) you have to check out Chickenstock. Billed as the “Top of the World Music Festival” with an emphasis on bluegrass and jam sessions. To get to Chicken you turn left on the Taylor Highway 12 miles east of Tok and head up the highway for more than an hour. There will be plenty of tour buses ferrying tourists to point north–Eagle, Boundary and Dawson City, Yukon so be carful. It was a beautiful drive. It rained at times but that is okay. It can be expected in Alaska in the summer. Along the way I stopped at Mount Fairplay, and the Mosquito Fork bridge and got out and stretched my legs. Did you know that the largest caribou herd in North America traverses the Taylor Highway every fall on their great migration south? Next NaBloPoMo: Did you have an imaginary friend?